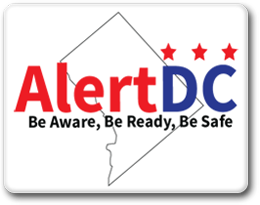 AlertDC is the official District of Columbia communications system allowing you to pick the type of emergency alerts, notifications, and updates directly from the District of Columbia’s public safety officials. By staying informed, AlertDC is your personal connection to real-time updates and instructions to protect yourself, your loved ones, and your neighborhood. View current alerts. AlertDC allows you to pick and choose what kind of notifications you want to receive through text and/or email. You can pick alerts about traffic, police events impacting public safety, widespread power and water utility outages, school & city government delays and closings, and much more. Plus, you can select the neighborhood or neighborhoods of interest to you – maybe it’s your child’s school, your office, or your favorite hangout. To sign up, click on the “Sign Up for AlertDC” button below. If you already have an account, click the “Update your Profile” button below.